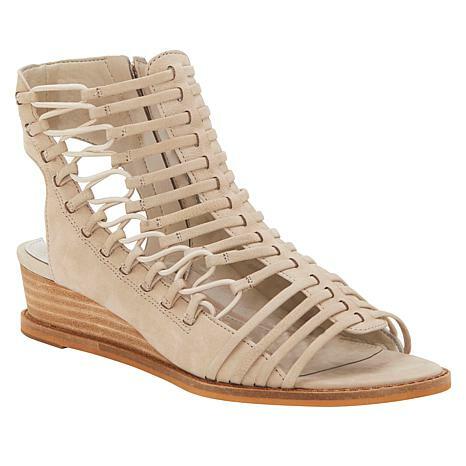 Seize the day, comfortably clad in a gorgeous gladiator built on a low wedge heel. Easy to get into via the side zipper, the Romera also has elastic lacing for a bit of stretch. I ordered, but was not sure if I'd keep it, because of the price. Received it, tried it on and it's a keeper! Heaven for the feet! True to size. Goes with everything, love that it's not flat! Thank you! Im returning this shoe, its just not right for me. 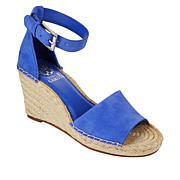 I love Vince Camuto shoes and this pair doesn't disappoint. It is the perfect summer sandal. I live that it has a small heel but is still so comfortable. Can't wait for the weather to warm up so I can wear them all the time. Fits true to size but just slightly tight around the ankle. I think they'll stretch out a little with some wear. 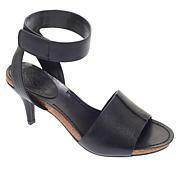 Beautiful sandals, but too tight and rubs at the ankle. Sadly back they went. I purchased a size 10 , black and my daughter that wears a 8 could fit it. I was so UPSET that a $100 shoe was 2 sizes tooooo small. I gave them to the daughter, durned it. She said they feel really good on her feet.